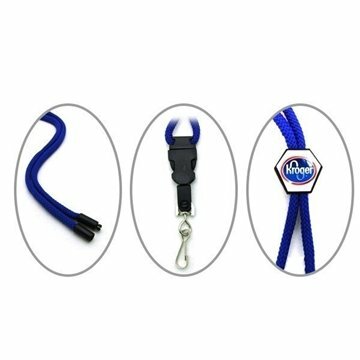 This rope cord lanyard is constructed out of polyester and features a hex slider and detachable plastic, side squeeze buckle. An ideal giveaway item at trade shows and conventions, this colorful accessory can be customized with a full color logo under epoxy dome. Choose from the classic j-hook or split ring attachments and hand out during the next health care event you attend. A cylindrical breakaway clip is included. Like it. It's very sturdy and lightweight. Purchased one, our logo surely stands out! Materials used were good and printing was large enough to read. Loved it. So did the boss. the order arrived more quickly than promised. the rep was very helpful.